Diabetes is the No. 1 cause of kidney failure, lower-limb amputations, and adult blindness. In the last 20 years, the number of adults diagnosed with diabetes has more than tripled. When you eat meals, most of your food is digested and broken down to glucose. When glucose is present, your pancreas releases insulin in order for your body to move glucose into the bloodstream so it can be used for energy. If you have diabetes, your body either doesn’t make enough insulin or can’t use the insulin it makes as well as it should. When there isn’t enough insulin or your body stops responding to insulin, blood sugar builds up in the bloodstream and cannot be used for energy. What Happens When You Have Diabetes? Uncontrolled diabetes can lead to major complications such as heart disease, kidney failure, blindness, and nerve damage (nerve damage can lead to amputation of a toe, foot, or leg). Some studies suggest that diabetes doubles the risk of depression and that risk increases as more diabetes-related health problems develop. All can sharply reduce the quality of life. There are two different types of diabetes, and each comes with its own unique set of symptoms and challenges. Type 1 diabetes is a condition in which the body doesn’t produce any insulin at all, or it produces too little. When untreated, this causes a person’s blood sugar to spike and can lead to further health problems. Type 2 diabetes occurs when the body does produce insulin but it can’t make use of it the way it should. This causes the pancreas to create more insulin as glucose (sugar) in the blood builds up. Many diabetics experience intense shifts between high and low energy depending on their blood sugar level. They may also struggle with severe weight loss or weight gain and experience higher levels of hunger and thirst. As if living with these symptoms isn’t enough, people who have diabetes are at a higher risk for developing other health complications. For example, weight gain caused by diabetes can lead to heart problems and even digestive issues. Gum disease, serious eye issues, and kidney disease are also more likely to affect those living with diabetes. It’s one thing to understand how your blood sugar is supposed to work and another to accurately track it and treat it throughout the day. For many diabetics – and their caregivers – this is their biggest struggle. Here are a few tips to make your diabetes (or that of someone you love) more manageable. Many diabetics check their glucose levels multiple times every single day. Give your meter a designated storage area when you’re not using it. Put it in the same spot whenever you’re at home and work. Keep it in the same bag when on the go, too. This will give you the peace of mind of knowing exactly where your glucose meter is, eliminating the need to look for it in a fret. If you or someone you know has type 1 diabetes, keep sugary snacks handy. This can be a can of soda, a few pieces of candy, dried/fresh fruit, or glucose pills. Whatever you choose to have as an emergency dose of sugar, make sure you never leave the house without it. Another way to make living with diabetes more manageable is to plan better. Tell your pharmacist to fill all your prescriptions on the same day and ask them to pre-package your medications for each day of the month. Also, keep an extra dose of medication in case something comes up throughout your day. This is arguably the most beneficial diabetic resource of all. Only other diabetics can truly understand what it’s like to live with this condition. As much as you may want to lean on loved ones or have the diabetics you care about look to you for support, it’s a good idea to add a few diabetics to your support circle. They’ll get it. They won’t judge your condition or oversimplify the experience. They’ll meet you where you are and walk beside you on this journey, which can sometimes be the strongest type of medicine. 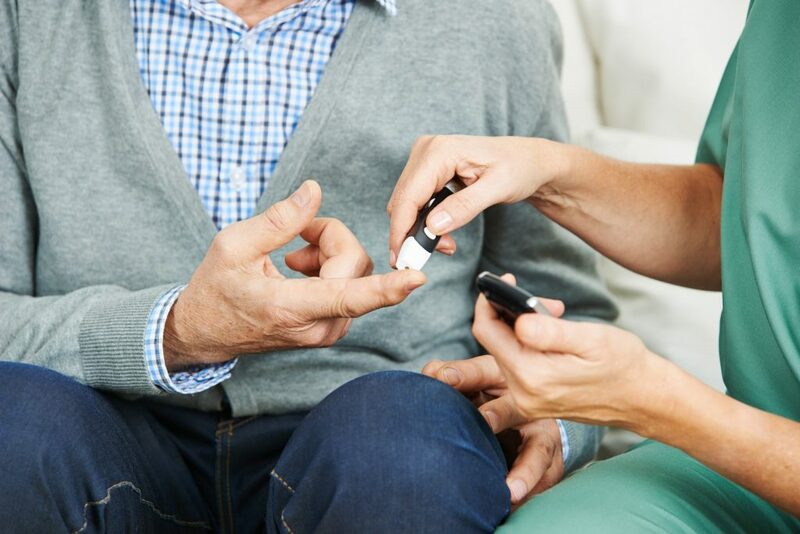 Diabetes Skills Management at Suburban Hospital – Learn more about how to better manage and prevent complications from diabetes. This interactive workshop includes strategies from a Registered Dietitian, Clinical Pharmacist, and Certified Diabetes Educators. Classes are held year round. Registration is required. Diabetes Support Group and Sibley Memorial Hospital – Sibley Memorial Hospital offers a Diabetes Support Group to the community that meets quarterly. The support group is free, does not require a referral from a doctor and is open to people of all ages. If you’re the caregiver for someone living with diabetes, remember you’re not alone. Just as diabetics can benefit from a community, their loved ones can find strength in numbers, too. Contact us today to discover everything our in-home caretakers can do to lighten the load for you and make your loved one’s experience with diabetes much easier.